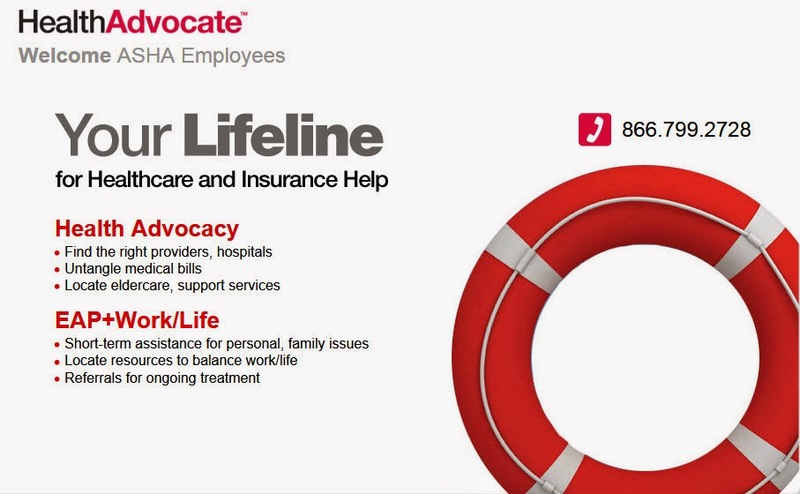 As I was reviewing year end reports from our carriers, the dramatic difference in the utilization of our health advocacy services with Health Advocate and our EAP services with Lifework Strategies stood out to me. In 2014, staff used the health advocacy services 368 times while our EAP was only used 21 times. That put our EAP utilization at 8% which is double the industry average, so it was being presented as a positive indicator.Yet it prompted me to do the math. Each contact with our EAP cost $295 while our health advocacy services cost only $22 per interaction. We talked with the folks at Health Advocate to see what other services they provide and learned that they have an EAP. They described a very proactive approach to service delivery. If someone calls them for help sorting out some medical bills that are piling up, they can also offer financial services that are provided through the EAP. If a new parent calls to find childcare, they can ask questions to identify any parenting issues and offer relevant services. This appealed to us. Obviously our staff think to seek health advocacy help, so why not capitalize on that to deliver our EAP services. When I was at the Health and Benefits Leadership Conference, I met Nate Randall from Tesla Motors. He mentioned that their EAP utilization rate is about 40%. Wow! Now they do offer concierge services that appeal to their staff and that increases their utilization, but he also said they never talk about it as an EAP. They just market the available services. That makes sense to me and fits with another initiative I'll be sharing more about soon, so this may be the last time I write about our "EAP." How Safe Are the Hospitals We Use? If you're a regular reader, you know that I've been focused on hospital safety recently. I asked UnitedHealthcare for a report showing the hospitals participants in our plan used in the past 12 months. Then, I used Leapfrog's Hospital Safety Score to see how each of the hospitals we used are graded. The Hospital Safety Score grades hospitals on how safe they are for patients. Each A, B, C, D, or F score assigned to a hospital comes from expert analysis of infections, injuries, and medical and medication errors that frequently cause harm or death during a hospital stay. The score is calculated using publicly available data from the Center for Medicare & Medicaid Services (CMS), the Leapfrog Hospital Survey (where applicable), and secondary data sources. The Hospital Safety Score methodology has been peer-reviewed and published in the Journal of Patient Safety. You can pull up the letter grades of the hospitals anywhere right on your smartphone with the Leapfrog Hospital Safety app. (If you don't have it, download it now.) The hospitals in the DC Metro area range from an A to a F. There are other tools out there, but I really appreciate how Leapfrog differentiates the choices for patients. I urge you to look at the scores before going to a hospital. And, if you wind up at one with a poor rating in an emergency, remember you can move to a different hospital once you're stabilized. Unfortunately, the hospitals in Maryland are not scored. Maryland hospitals have their own payment system for reimbursement and they're not required to submit data to the Centers for Medicare and Medicaid Services (CMS); therefore, organizations like Leapfrog don't have access to the data. 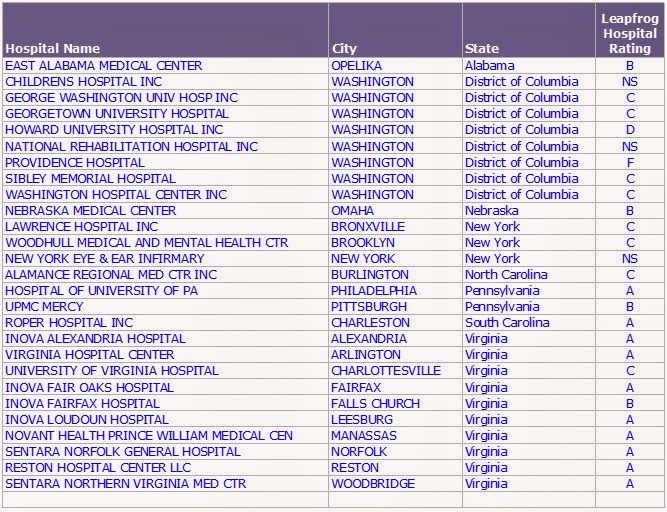 Maryland operates the nation's only all-payer hospital rate regulation system and they're the only state that does not share its' data publicly. There are also some critical access hospitals, specialty hospitals such as children's hospital, and cancer hospitals for which there is insufficient data to assign a score. In these instances, I suggest using Carechex to access hospital quality ratings. This is how the hospitals we used are rated. I hope we can shift more of our utilization to the A's and B's. We really don't want sponges left inside of us, surgery on wrong body parts, and secondary infections just to name a few of the "never events" that occur too frequently at the hospitals that received poor ratings. FYI: I can see the number of inpatient admissions, the number of inpatient days, the number of outpatient services and the net paid. No information is included that indicates what types of services were received or who sought the services. I mentioned how we're using Airbo during my presentations at the Health and Benefits Leadership Conference and the World Health Care Conference. 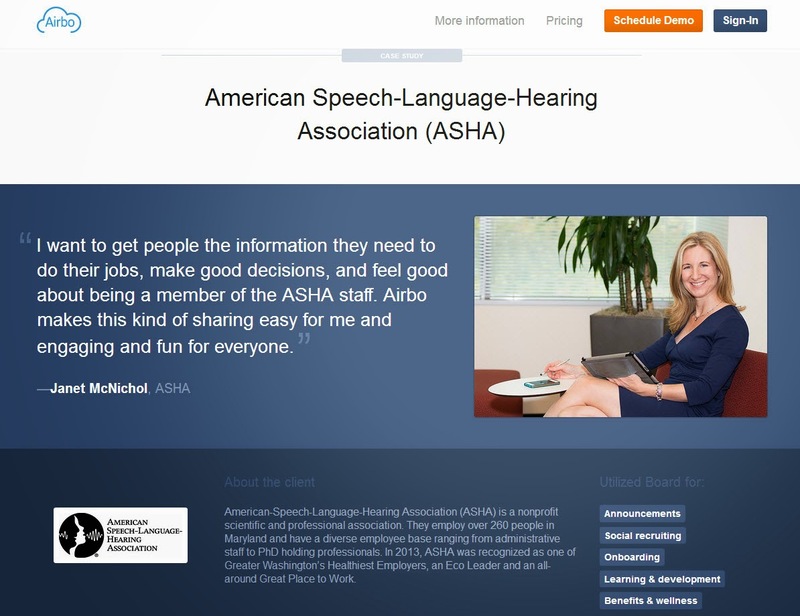 A number of folks inquired about the product, so I thought I'd share this case study Airbo has posted about ASHA. I had the pleasure of attending both the Health and Benefits Leadership Conference and the World Health Care Congress recently. I've heard some inspiring things, connected with true thought leaders and learned a lot. I'll share some of the things here that I keep turning over again and again in my mind. Large employers like Zappos, Intel and Dartmouth College shared their stories about setting up Patient Centered Medical Homes (PCMH). They all were compelled by wanting to provide high quality, high value, care for their employees. Employees that receive care at a PCMH can be steered toward specialty physicians with high quality ratings and a reputation for adhering to evidence-based medicine. They all employ health coaches to work with patients on life-style related issues. Rushika Fernandopulle, MD, MPP from Iora Health that runs Dartmouth's PCMH told a compelling story about how a coach gave a patient pedicures as a way to develop a connection and get her to come in weekly to discuss the management of her diabetes. All the initiatives are quite new, but they're reporting a high level of satisfaction from their employees and a positive impact on measures like patient compliance with disease management. Dr. Zubin Damania of Turntable Health that delivers Zappos's PCMH delivered a particularly engaging presentation during the Ideas and Innovators Forum at the Health and Benefits Leadership Conference. He's a rapper, comedian, MD that knows how to command a crowd. Check out the Turntable story on YouTube. At this point, I don't see any real application of PCMH for small employer unless they form coalitions within their communities. I also think this is more appealing to employees that work in areas where good medical care as not as abundant as it is in the Washington, DC area where I work. We're also hearing a lot about narrow networks. Years ago narrow networks were created of providers that had agreed to the steepest discounts with the network managers. Today narrow networks are being created around providers that meet quality measures. In HR, we've traditionally evaluated health plans based on how many providers were in network -- the more the better. The broader the network the greater choice our employees would have and the more likely their existing providers would take part. When employees complained that a provider they wanted to use wasn't covered, we in turn went to the network manager to complain. Today's savvy benefits managers are taking more of a leadership role. They're insisting that providers with poor quality measure are excluded. Others are building a new tier into their benefits design to push employees toward higher quality providers. I got into an interesting discussion about this recently -- a colleague presented a case that employees should have the right to chose. I agree to a point. I believe those of us with the most information have a responsibility to present good choices to those we serve. Let's say I'm a real-estate agent in a beach community and I'm helping you rent a beach house for the summer. There are four properties that meet the criteria that you're looking for, but I know one is poorly constructed. It has a deck that isn't to code and it has a high likelihood of collapsing while you sit on it enjoying your morning cup of coffee, it also has shoddy wiring that greatly increases the likelihood that it will catch on fire while you sleep. Am I doing you a service by including this house so that you have four options instead of three? Likewise, do we want to include irresponsible investment options in our defined contribution plans just to say we provide greater choice? We know that having more options doesn't lead to greater satisfaction among consumers. The article, The Tyranny of Choice that ran in The Economist eloquently makes this point. Tom Emerick and I during our presentation. I met at these conferences over the past weeks. I presented with Tom Emerick during the World Health Care Congress. I'd read Tom's book Cracking Health Care Costs and found many of the points he'd made compelling, but we had not met before. We spent a couple hours before our presentation talking and that was some of the most valuable time I spent at the conference. Tom pointed out that a true leader would narrow the choices to the good options and be willing to take the heat from employees that complain that a poor hospital is no longer in the network. Tom makes a good case for having a broad primary care network, but a narrower, high quality specialty and hospital network. If there is any low hanging fruit here, (this is an easy argument to make conceptually, but a much harder one to implement) it would be to start by eliminating non-emergency coverage at hospitals with unacceptable safety ratings. Another highlight of the World Health Care Congress was hearing from Leah Binder of the Leapfrog Group. Leapfrog was formed in 1998 by a group of large employers that wanted to be able to assess differences in and compare the quality of care between health care providers. Leapfrog scores hospitals in 38 regions with 1,300 hospitals voluntarily participating in their survey. In a lot of instances, employers are compelling their local hospitals to participate. The result is that each hospital receives a letter grade A-F based on four factors -- computer physical order entry, evidence based hospital referral, ICU physician staffing, and a safe practices score. The safe practices score is based on the frequency of "never events" like pressure ulcers, falls, air embolisms, and objects left inside a patient. It includes infection rates for three of the most common and deadly hospital-acquired infections and the rates of other generally preventable harm or death to patients. Leah Binder likened the occurrence of "never events" in a hospital to US Airways Flight 1549. How did US Air respond? They sent a letter of apology to all the passengers. They explained how the National Transportation Safety Board had begun an investigation and how they were cooperating. And, they reimbursed people for the cost of their tickets plus $5,000 to assist with immediate needs. What happens in a hospital? Hospitals don't apologize and they continue to bill patients and insurance companies for the cost of the care to correct their errors. Can you imagine US Airways sending passengers a bill for the cost of the rescue? You can actually pull up the letter grades of the hospitals anywhere right on your smartphone with the Leapfrog Hospital Safety app. (If you don't have it, download it now.) The hospitals in the DC Metro area range from an A to a F. There are other tools out there, but I really appreciate how Leapfrog differentiates the choices for patients. Scoring systems and accreditation that make all hospitals look equal don't help patients differentiate their choices -- Leapfrog clearly does. Unfortunately, Maryland doesn't share hospital data. It's the only state in the nation that doesn't and I'm still trying to fully understand why. I could go on and on about how Maryland is a difficult state for employers to operate from a benefits perspective, but this issue frustrates me more than most. "More than 57,000 people die needlessly each year because physicians' practice vary from standard practice/evidence based guidelines... what medical science tells us they should get. These deaths should not be confused with those attributable to medical errors or lack of access to care." Later, Dr. Bourland pointed out that patients need to take the time to evaluate their options. It's rare that patients will be harmed by not rushing into treatment. We know that when patients have more information, they chose less invasive therapy and have a higher satisfaction rate. People need to take the time to make informed decisions. I think it was Patricia Spellman from Dartmouth College that pointed out that employers shouldn't have to be this involved in health care, but it is our reality. Truer words were never spoken. I may not be able to influence what goes on at the national level, but I have a responsibility to provide access to the best care possible for the ASHA staff. I intend to make up for the roadblocks we hit because of our small size by educating our staff to be savvy healthcare consumers. Lots more on that to come. You can review the Twitter Feed from the Health and Benefits Leadership Conference and the one from the World Health Care Congress thanks to Carol Harnett. Be sure to check out Carol's post on private exchanges. She covered it so well, I saw no need to rehash it here. I'm also compiling a reading list from the two conferences that I'll share in a separate post.